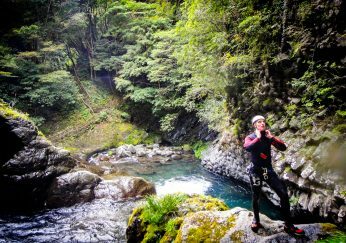 Situated in the foothills of Kusatsu Onsen, in the Gunma District, lies one of the most intriguing canyon courses around. 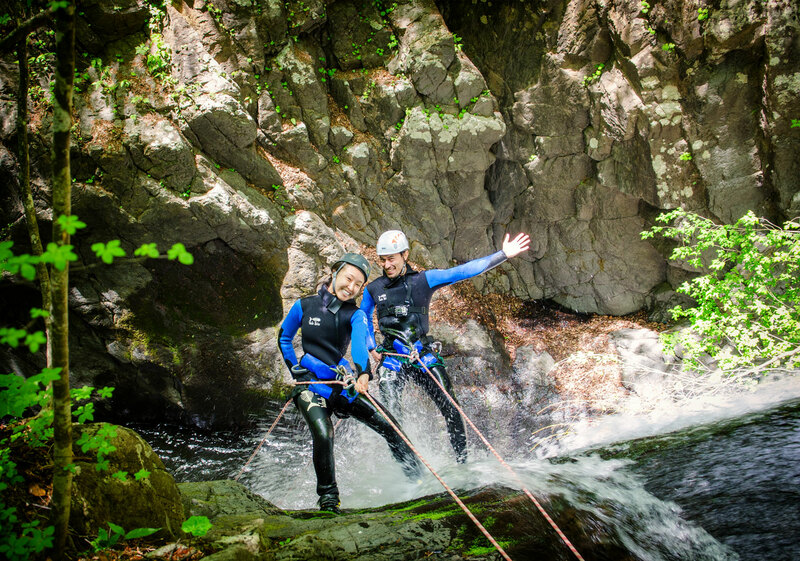 We spent a day of sliding, jumping and abseiling down seven unique waterfalls up to twenty meters in height in refreshing, cool water; the perfect escape for the summer weather and a great way to spend a day with friends. 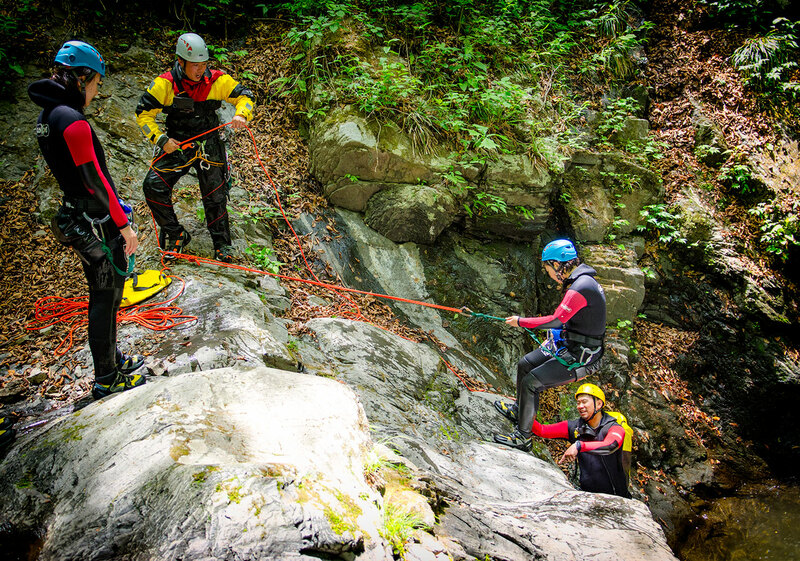 The meeting point for this course is Canyons’ Agatsuma Base, located just five minutes’ walk away from the starting point. A quick change into our gear, some safety checks and we’re off through the forest. 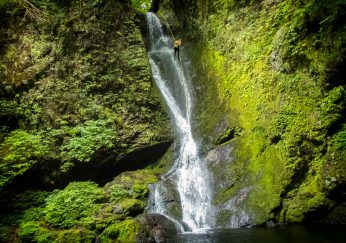 The first waterfall (Satsuuzen no Taki) is a twenty metre drop and is rigged as a zip line from top to bottom. 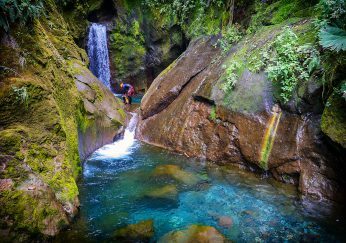 As with some courses in Japan, they are located near tourist trails and we surprise two people taking photographs of the waterfall. It still amazes onlookers as they watch people abseil or slide down the waterfalls. 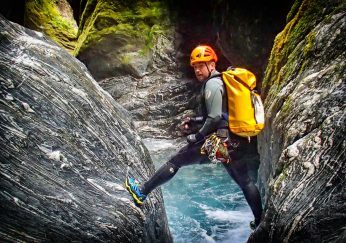 After all the team membershave managed to slide on down we pack up the rope and move onwards along the canyon to the next waterfall. 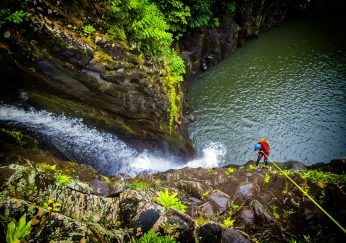 Ido no Taki is a double waterfall which has both a jump and slide. Everyone gets lowered down to the ledge below before jumping into the middle pool. 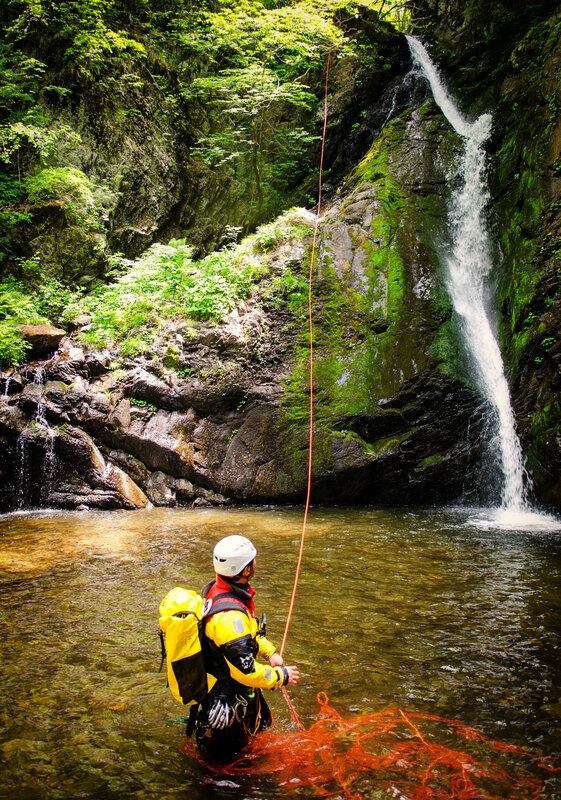 It’s only a small jump but for people who haven’t much experience it can be exhilarating. 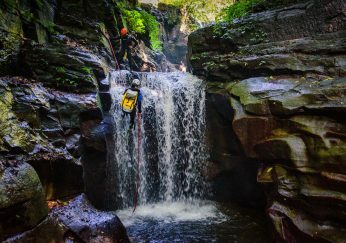 After plunging into the cool water, everyone makes their way over to the next section of the waterfall and where it is an assisted slide down the face. It’s already been two hours since we started and we’re only halfway through. 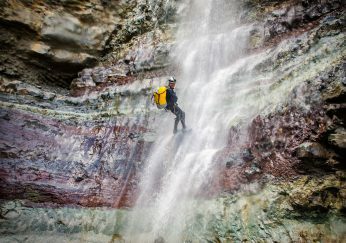 After a quick break and a bite to eat, it’s onto the last remaining falls through the canyon. The heat outside the canyon must be getting warm but down here, even with wetsuits on, everyone is feeling refreshed. The last four waterfalls happen in a pretty quick succession. 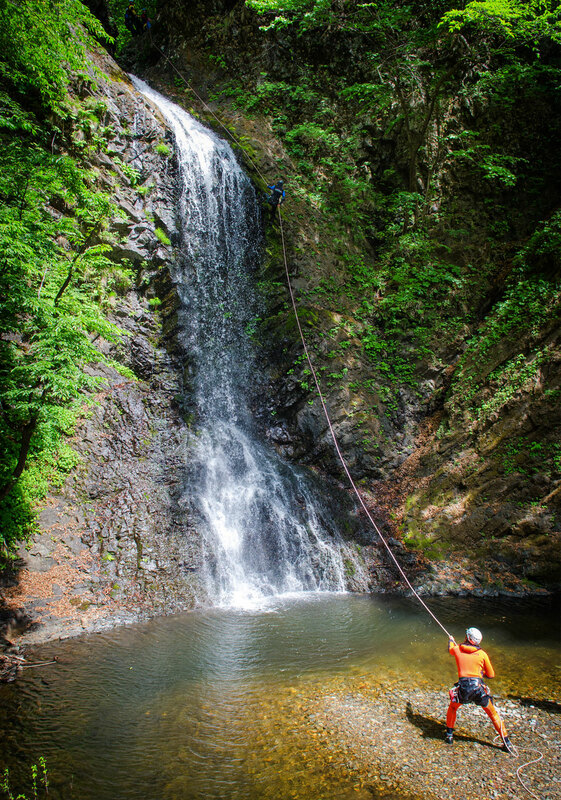 The first abseiling section is down the third waterfall (Fushigi no Taki). It’s only small in size at 5 metres and everyone is eager to abseil down. Upon reaching the bottom it goes straight into the fourth waterfall (Kyunai no Taki). A short walk away we are at the fifth ledge(Hako no Taki) where everybody jumps off into the deep, green water below. We’re coming up to the final drops and the last two are the best. 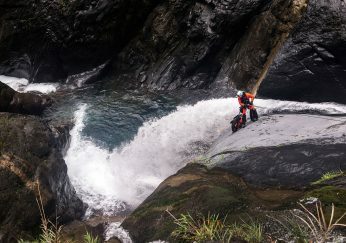 The double waterfall (Data no Taki) starts with a nice assisted sliding section. 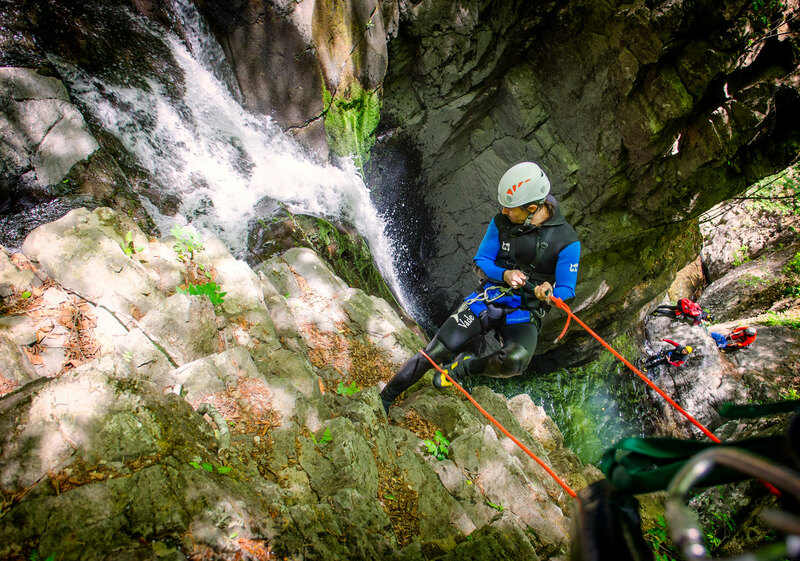 Standing on the edge of the second half of the falls, everyone has their safety lines firmly attached and move to the abseil section of the falls. Six falls done, one more to go and it’s the best. 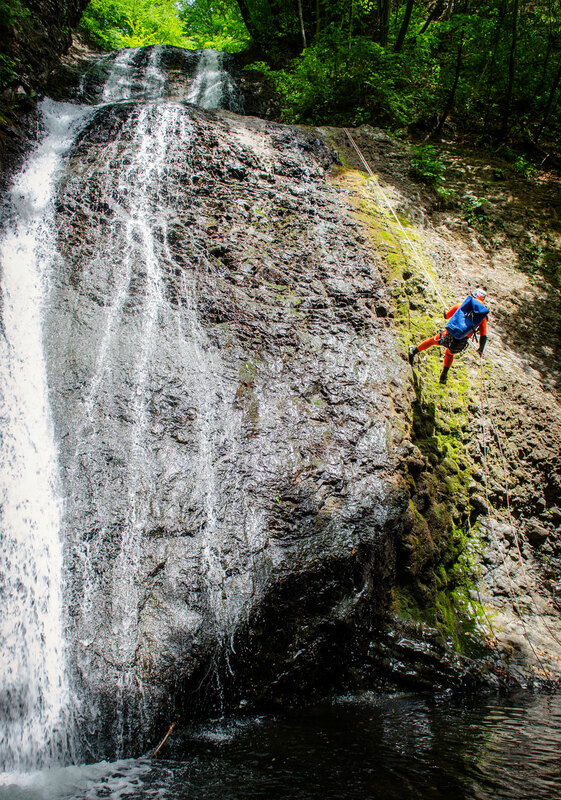 The final waterfall (Oozen no Taki) is a fifteen meter abseil straight over and down. Everyone is clipped in to the secured line as we all edge our way along the side of the cliff wall. 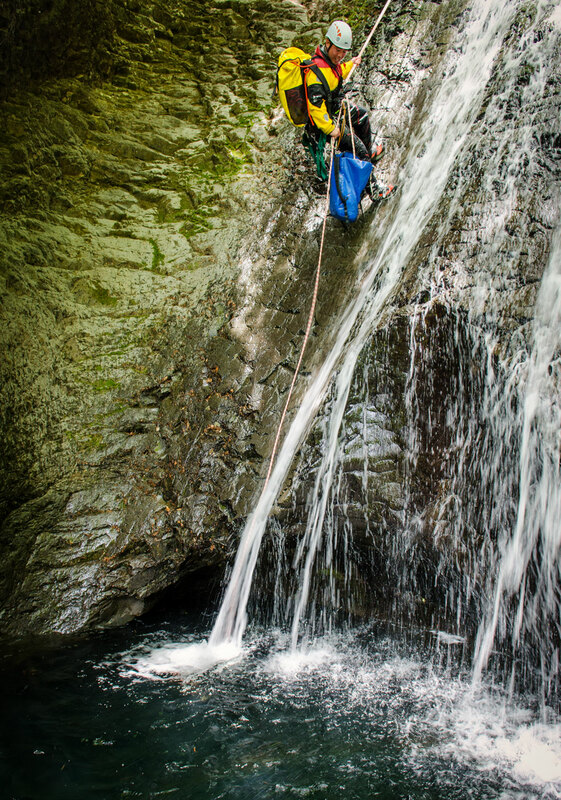 A quick up and over and we abseil down on the edge of the racing water only to make our way back into it, to finally end up in the bottom pool. And there it is,seven waterfalls in just one day. Deer Canyon is an amazing course and can be split up three different ways depending on experience. 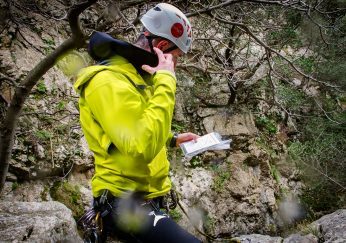 Thanks to Canyons Minakami and the participants for allowing us to tag along and document the journey.